Aggressive dogs are not allowed. The handler of any dog exhibiting aggressive or unruly behavior is required to immediately remove the offending animal. The owner/guardian of an unruly dog is fully responsible for the actions of the dog. 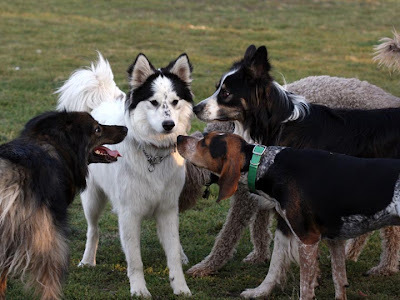 The following tips/recommendations have been assembled in order to help you and your dog get the most enjoyment during your visits to the Moscow Dog Park. Keep dogs on leash until they are inside the double gate. The animal shelter shares the same parking lot as the dog park and they may have dogs and/or cats in the parking lot being introduced to people. vulnerable being on leash while other dogs around it are off leash. The leashed dog knows that it cannot maneuver freely and cannot get away if it wants to. This sense of vulnerability may lead to aggression. Users already inside the park should call their dogs away from the gate until the new arrivals have entered. It's difficult for a new arrival to enter the park if a wall of dogs is blocking the gate. Dogs are territorial creatures, and the boundaries of a territory are flashpoints for aggression. Once the dog is inside the territory, the chances for conflict are much less. If people are not calling their dogs to them when you are about to enter, you may ask them to call their dog, or stand there until their dog walks away. Remove metal collars. This includes prong or "pinch" collars, choke chains, and spike collars. There is the risk of other dogs breaking their teeth on the collar, especially if engaging in mouthy play. Understand canine communication. Dogs that enjoy rough play may growl and snap as part of that play. Dogs may also snarl and/or snap to "set their limits" with other dogs-for example, to let another dog know that it is being too rough or too pushy. Respond promptly to aggressive behavior. Deciding what constitutes aggressive behavior is sometimes a matter of judgment. It's important to know your dog and to know what is normal and safe for your dog. It is recommended that dogs be spayed or neutered before coming to the dog park. Be aware that unneutered males in particular are much more likely to get into fights with other male dogs. ** Females in heat may not enter the park. A dog park is not necessarily a safe place for young children. If you choose to bring a child into the dog park, it is vitally important that you supervise your child closely. You must take full responsibility for your child's safety while in the park. Do not allow children to behave wildly in the park. Do not permit them to run, scream, chase the dogs, grab the dogs, tease the dogs, or play with their toys. Some dogs are not used to small children; these dogs may feel scared or threatened if a child runs toward them or grabs at them. Dogs often run fast and play vigorously with each other while in the park, and they may inadvertently knock down and hurt a child who is standing out in the open. Children should never approach or touch any dog without first asking the owner's permission. The safest place for a child is sitting quietly on the picnic table or standing by a parent's side and holding the parent's hand. Remember that your main responsibility while in the park is to monitor your dog and to be prepared to intervene if there is any sign of trouble. Before bringing children to the park, consider whether you can effectively supervise both the dog and the children at the same time. Clean up after your dog. Plastic bags/scoopers are provided.